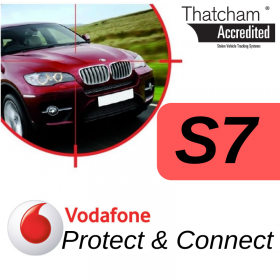 The Vodafone S7 VTS GPS tracker is the new name for the Vodafone Protect& Connect CAT6. Therefore, if your insurance company have specified that you need an S7 tracking device then this will be exactly what they mean. Price includes your Vodafone S7 VTS installation at home, work or even the vehicle dealership to fully install your S5 device. Insurance approved vehicle tracker suitable for all makes and models (Including caravans, motor homes, HGVs, plant machinery and boats). Pinpoint GPS tracking. Using multiple satellite networks for the most accurate and consistent location. Free tracking App for your Smartphone called My Connected Car download from your App Store and view a tracking demonstration. Free Live tracking app. Monitor your vehicle and set up alerts directly from your phone.